Maths Rockx mashes together maths and music to inspire kids to learn the times tables in a unique and upbeat manner. The students sing along to popular tunes but with the original lyrics replaced by the list of multiplications from 2 to 12. The songs on offer are from top names in the music industry such as Pharell Williams, Pink and One Direction (for those of us a little out of touch with what the kids listen to, this is quite a big deal!). There is even the odd classic thrown in, like Jerry Lee Lewis’ ‘Great balls of fire’ for the two times table. The main menu screen has four options, the first being ‘Why Maths Rockx?’ which is a set of Introductory videos on how the app came to be. This sums up nicely the back story as well as revealing the thinking behind the app for the sake of teachers or parents. The ‘Quiz’ option is a simple and straight forward random selection of 12 questions based on the selected times table. The app provides immediate feedback correcting any mistake with a final score displayed at the end. During the quiz the background music played is the associated instrumental tune for the chosen times table and acts as a prompt for the listener. There are four levels of difficulty for the quiz available based on a time limit for answering each question. ‘Time Tables’ is where the principal learning takes place. The list of the 12 times tables is displayed along with the tune that it is sung to. Once you select a table there are essentially two different versions on offer. The first is just a simple instrumental song which plays in the background while the lyrics are shown on the screen in full. The second is the ‘sing’ version with the tune pumping out along with a singer’s voice allowing you to find out how the lyrics fit the music. This can be paused and restarted by a tap of the appropriate button. The last option on the menu screen is ‘Playlist’; a chance to put together your own sequence of tracks in any order. The concept of Maths Rockx is strong and that is key. At the heart of it is a successful idea that is still in production and there are still some tweaks needed. There is a promise of an update coming soon that will include a revamped quiz and fingers crossed that will include a method of recording assessments. This would help provide students with an indication of their progress as well as identifying areas of improvement. The cost for a single purchase is noticeably more expensive than the average app, however this is said to account for the royalties to the original music used in the app. It is worth remembering that what you get for this price is a fresh approach that will certainly get kids on board who previously would have had zero interest. Tablet technology has become a platform for educators to bring to life creative ways for effective learning and we have here a prime example of the success it can achieve. A humble experienced teacher has been able provide a teaching technique that works and shared it with other educators globally. This is the Rock Star Teacher that everyone wants! 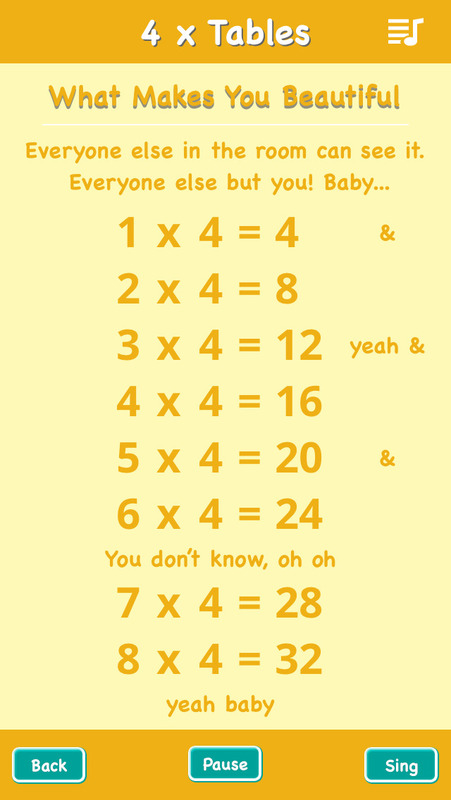 Your children will learn their Times Tables by singing them to the coolest tracks, from some of the world’s best artists! One Direction, P!NK, Lady Gaga, will-i-am and Pharrell Williams - to name a few. They will love bopping away to the new Times Table lyrics while they learn. Maths has never been so cool, so easy and so much fun! It just Rockx! 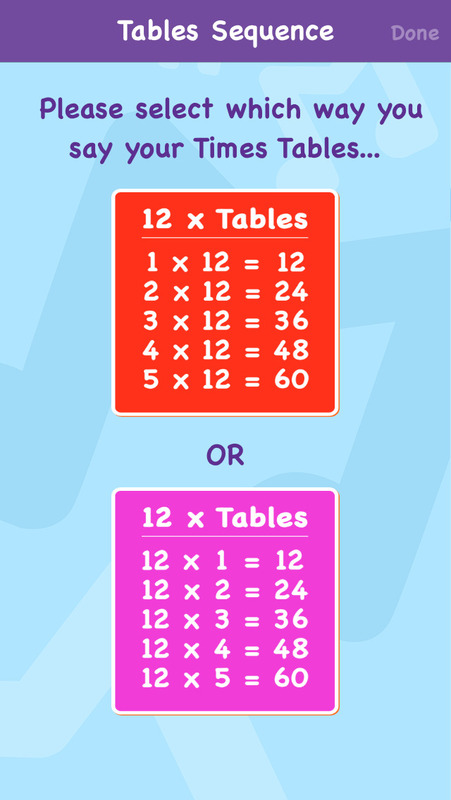 Each Times Table is a different colour and has both an Instrumental version and a Vocal version. 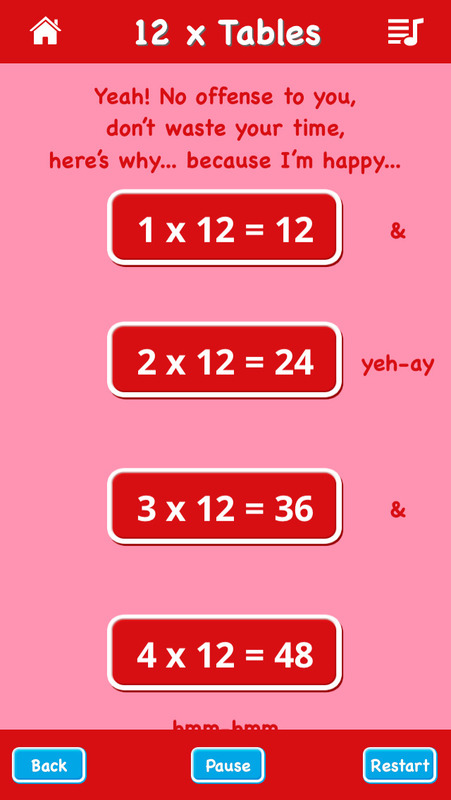 In the Vocal versions, each equation is animated as the children sing the corresponding line. This creates a visual, aural and verbal connection for them. 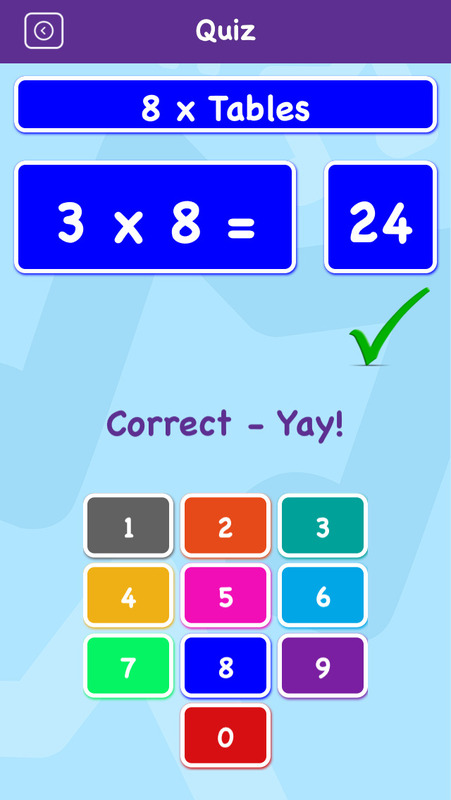 Test your child’s abilities and progress in the Quiz feature, while the instrumental track plays along - they then receive a score out of 12 for that table. The multiple Playlist feature allows you to create your own playlists from the 11 awesome tracks in the app. This lets you choose which songs you want to listen to, and in which order. Bluetooth it to the stereo and rock out in the lounge room together, in the car or in class. Enjoy the professional “studio quality” of the music production as your children learn. It will make them feel like they are simply singing new lyrics, to really cool songs, rather than actually doing work. How often have you heard a song come on the radio that you haven’t heard in years, yet somehow, you know the next line to the song without consciously thinking about it? Maths Rockx uses that exact principle for your children. This is it - Maths does Rock!